I consider my mother in law an expert in all things Jello. She makes the most amazing Jello desserts and I am not a huge fan of Jello. I do not have her skills, so I will have to have her make some of my favorite jello recipes (over pear halves...YUM!) and just take some pictures while she does it to share with you. That is if she will give up her Jello secrets. The reason I tell you this is that I can say with confidence that my mother-in-law would think these jello hearts were worth trying this Valentine's Day. 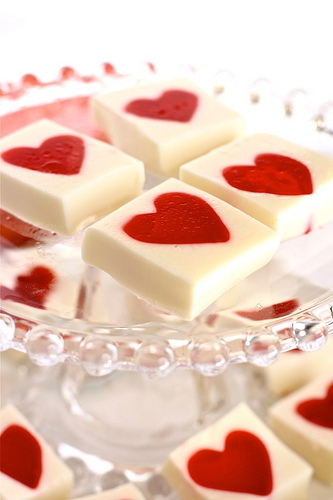 Who wouldn't want cute heart shaped jello for Valentine's dinner? You can get the the Jello Heart recipe over at They Hungry Housewife.